Which college is the right fit? If you are preparing for college soccer, or still in high school and striving to be a starter on the Varsity soccer team then you must know that preseason usually begin August 15th, for college and in many parts of the US for high school. May I make some suggestions? Having gone through this process with two of my children, I recall that each received a training program sent by snail mail/email with a daily workout schedule. This schedule was to be followed religiously so that when they arrived to preseason they were "in shape" and ready to go! It included daily workouts and of course daily running. Eating a balanced and healthy diet can also enhance your readiness for preseason. If you party hearty each night, yes you will gain unwanted weight and have loss of sleep, which will simply make your body tired by day and unwilling to train at the highest level. Always a good suggestion is to run on the track at your local high school. Bring a friend along who will run with you. Keep a log of your times for the mile and your personal best, always trying to improve upon it. I might also suggest that you play on a summer team if possible and be faithful to your training program. I suggest you join a gym and work on your strength, endurance and fitness, perhaps a cross-fit training program. One of the best training tools is the pool, if you have a backyard pool or a lap pool this is great for cardiopulmonary fitness; if not there is always the Y. Working on lower extremity strength is particularly important, as you need power. Female soccer athletes like to focus on upper body strength making their thrown-ins more powerful. Michael Farese, soccer, Sayville High School, Sayville, NY; Bayport Soccer Club, will be attending Gettysburg College, in Gettysburg, PA, NCAA D-3, Centennial Conference. Gabrielle Corrente, soccer, Mount Sinai High School, Mount Sinai, NY, Eastern New York ODP, will be playing at Robert Morris University, PA, NCAA D-1, Northeast Conference. Joshua Weiss, soccer GK, Saint Anthony’s High School, HBC Soccer Club, will be playing at Siena College, Loudonville, NY, NCAA D-1, MAAC Conference. Luka Martinovic, soccer, Saint Anthony’s High School, Eastern New York ODP, Regional and USSF Academy, B.W.Gotchee, will be playing at University of Pennsylvania, NCAA D-1, Ivy League. 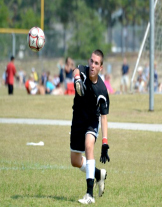 Ryan Zerkel, soccer GK, Stonewall Jackson High School, Mount Jackson, VA, Winchester United Soccer Club will be playing at Eastern Mennonite University in Harrisonburg, VA, NCAA D-3, Old Dominion Conference. Eric Fenton, football (kicker), Eastern Alamance High School, Mebane, NC, will be playing at North Carolina Central University in Fayetteville, NC, NCAA D-1, NEAC Conference. Brendan McGovern, lacrosse, Rocky Point High School, Rocky Point, NY, Team Long Island Club Lax, will be playing at Belmont Abbey College, in Belmont, NC, NCAA D-2, Carolina Conference. Connor Goonan, lacrosse Goalie, Northport High School, Northport, NY, Team Tiger Club Lax, will be playing at Savannah College of Art and Design, Savannah, GA, NCAA D-3, Sun Conference. James Serra, soccer, Concordia Lutheran High School, Tomball, TX, Texans Soccer Club, will be playing at State University of New York New Paltz, NCAA D-3, SUNYAC Conference. Joseph Escamilla, soccer, Saint Anthony’s High School, South Huntington, NY, Eastern New York ODP, Region I, USSF Academy B. W. Gotchee, will be playing at Hobart College, Geneva, NY, NCAA D-3, Liberty Conference. Stefan Gualano, soccer, Mamaroneck High School, Mamaroneck, NY, Eastern New York ODP, Regional level, USSF B.W. Gotchee Soccer Academy, will be playing for University at Stony Brook, NCAA D-1, America East Conference. Connor Panzner, basketball, Bayport-Blue Point High School, AAU, will be playing for York College of Pennsylvania, NCAA D-3, MWC Conference. Charles Deegan, football, Saint Anthony’s High School, South Huntington, NY, will be playing for the United States Merchant Marine Academy at Kings Point, NY, NCAA D-3, Landmark Conference. Emily Sears, soccer, (GK), Manhasset High School, Asphalt Green Soccer Club, will be playing at Albright College in Reading, PA, NCAA D-3, MAC Conference. Jack McKenna, soccer, Southside High School, Rockville Centre, NY, Rockville Centre Soccer Club and Long Island Junior Soccer League PDP, will be playing for Thomas College, Waterville, ME, NCAA D-3, NAC Conference. Bruce Kopka, football, Eugene Ashley High School, Wilmington, NC, will be playing at State University of New York Maritime College, Throggs Neck, NY, NCAA D-3, Skyline Conference. Eric Santiago, soccer, Monroe Community College, transfer to Western New England University in MA, NCAA D-3. Brady McSheffrey, soccer, Syosset High School, Syosset, NY will be attending Fordham University in New York, anticipating a walk on roster spot; NCAA D-I. Derek Nochisaki, soccer, Hauppauge NY, plays for Score FC, will be attending Clarkson University, NCAA D-3, majoring in engineering. Oliver Roberts, soccer, Chaminade High School, Mineola, NY, will be playing at MIT, Cambridge, MA, NCAA, D-3, NEWMAC conference. Oluwatosin Akinfeleye, soccer. Thomas A. Edison High School, Jamaica, NY, will be playing at State University of New York at Old Westbury, NCAA, D-3, majoring in AUTOCAD. I am very happy to say that the Class of 2013 is complete, see below for results of student-athletes who I have worked with this cycle and where they will be going to college/university and continue to play their sport. Dylan Crowe, soccer, (Goalkeeper) Eastern Alamance High School, Mebane, NC, will be playing at University of North Carolina at Pembroke, NCAA D-II, Peach Belt Conference, majoring in Physical Education, Athletic Training. Alanna Lynch, soccer (Goalkeeper), Trumbull High School, Trumbull, CT, will be playing at Smith College in Northampton, MA, NCAA D-III, ECAC, NEWMAC. Andrew C. Chen, soccer, Brownell-Talbot School, Omaha, NE, will be playing at Columbia University, New York, NY, NCAA, D-I, Ivy League, majoring in Engineering. Jack London, soccer, Montville High School, Montville, NJ, will be playing at Dickinson College in Carlisle, PA, NCAA D-III, Centennial Conference. Eric Tomeo, lacrosse, Wantagh High School, Wantagh, NY, will be playing at University of Scranton, Scranton, PA, NCAA D-III, Landmark Conference. Andrew Nelson, soccer, Southampton High School, Southampton, NY, will be playing at New York University, New York, NY, NCAA D-III, University Athletic Association Conference, majoring in Pre-Law/Business. Ryan Marti, baseball, (Pitcher) Smithtown High School East, Smithtown, NY will be attending Boston College, Chestnut Hill, MA, anticipates being an invited walk-on. BC competes in NCAA D-I, Atlantic Coast Conference. Kyle Knodel, soccer, Eastern Alamance High School, Mebane, NC, will be playing at Lenoir-Rhyne University in Hickory, NC, NCAA D-II, South Atlantic Conference and will possibly major in Pre-Law. Anthony Cappellino, football, Chaminade High School, Mineola, NY, will be playing at Colby College in Waterville, Maine, NCAA D-3, NESCAC; Anthony will be majoring in Pre-Medicine. Stephanie Nugent, soccer, Loreto Secondary School, Balbriggan County, Dublin, Ireland, will be playing at State University of New York Old Westbury, Westbury, NY, NCAA D-3, Skyline Conference. Stephanie will be majoring in Education. Maddie Barrosso, Chorus/Choir/Voice, Bayport Blue Point High School, Bayport, NY, will be joining the Music Department at Stonehill College in North Easton, MA. Frank Accardi, football, Valley Stream South High School, Valley Stream, NY, will be playing at State University of New York at Cortland, NCAA D-III, SUNYAC Conference and is considering majoring in Education. Nick Sarkos, soccer, Mainland Regional High School, Linwood, NJ, will be playing soccer at Muhlenberg College, Allentown, PA, NCAA D-III, Centennial Conference; majoring in Business. Shannon Bennett, soccer, Sacred Heart Academy, Hempstead, NY, will be playing soccer at Union College, Schenectady, NY, NCAA D-III, Liberty Conference; majoring in Pre-Medicine. Angelica Titor, Softball, Floral Park Memorial High School, Floral Park, NY, will be playing softball at University of Scranton, Scranton, PA; NCAA D-III, Landmark Conference. Lauren Worden, soccer, Connetquot High School, Bohemia, NY, will be playing at Jacksonville University in Jacksonville, FL, NCAA D-I, Atlantic Sun Conference. Lauren is considering majoring in Sports Medicine/Athletic Training. Samantha Bishop, soccer/track, Sayville High School, West Sayville, NY, will be playing soccer and running track at State University of New York Geneseo, Geneseo, NY, NCAA D-III, SUNYAC; Samantha is considering majoring in Psychology. Scott Knuth, soccer, Notre Dame High School in West Hartford, CT, will be playing soccer at Fordham University in Bronx. NY, NCAA D-1, Atlantic 10 Conference. Scott played club soccer for USSDA South Central Premier. Antonia Roros, soccer, Hauppauge High School, Hauppauge, NY, Farmingdale S.C, will be playing soccer at New York Institute of Technology, NCAA D-II, ECC; Antonia is considering majoring in Communications. John Platt, soccer, Chaminade High School, Mineola, NY, will be attending University of Rochester, Rochester, NY, NCAA D-III, UAA Conference, where he anticipates being a part of the men’s soccer program; John will major in engineering. Stephanie Sullivan, golf, Sacred Heart Academy, Hempstead, NY, will be playing golf at Siena College, Loudonville, NY, NCAA D-I, MAAC. Stephanie’s major is undecided. Jules Barrasso, field hockey (goalie), Bayport-Blue Point High School, Bayport, NY, has selected Springfield College in Springfield, MA, NCAA D-3, Empire 8 Conference; Jules is considering Physical Education as a major. Anthony Scarallo, soccer, Saint Francis Prep, Fresh Meadows, NY, Auburndale S.C,, will be playing soccer for City College of New York, Macaulay Honors Program, NCAA D-III, CUNYAC; majoring in Biomedical Engineering. Thomas Daly, lacrosse, Wantagh High School, Wantagh, NY, and Long Island Express Lacrosse Club; he will be playing lacrosse at Babson College in Babson Park, MA, NCAA D-III, competing in NEWMAC. Major will be Business with a concentration in Advertising. Nicolette Wilson, soccer, East Meadow High School, East Meadow, NY, will be playing soccer at Hartwick College, Oneonta, NY, NCAA D-III, SUNYAC. Josh McLeod, soccer, Lutheran High School, Brookville, NY, will be playing soccer at Dowling College in Oakdale, NY, NCAA D-II, ECAC, ECC. Josh played Varsity and club soccer for Score FC. Lauren Cassidy, lacrosse, Oceanside High School, Oceanside, NY will be playing lacrosse (face off specialist) at Manhattanville College in Purchase, NY, NCAA D-III, Freedom Conference, MAC. Lauren joins her brother Bobby, Hartwick College and sister Allison at Philadelphia University in the world of collegiate lacrosse. Adam Diaz, tennis, Floral Park Memorial High School, Floral Park, NY will be playing tennis at Mitchell College in New London, CT, NCAA D-III, NECC. Adam was recruited through the USTA Eastern Showcase at Saw Mill Club. Eric Friedlander, soccer, John F. Kennedy High School, Bellmore, NY, will be playing soccer for University at Buffalo, NCAA D-I, Mid America Conference. Eric played for Lake Grove United and also Shaddock-Saint Mary’s Prep. Christopher Ernest, soccer, Holy Trinity Diocesan High School, Hicksville, NY will be playing soccer at Molloy College, NCAA D-II, East Coast Conference. Christopher plays for the Brentwood Academy and previously played for Met Oval, Pre-Academy Team. Chris plans to major in law enforcement and criminal justice. Read recent testimonials from satisfied clients. College-Bound Athlete Scholarship Service locates and places student-athletes in colleges and universities where they can compete in their chosen sport while pursuing their academic goals. We assist student-athletes in securing athletic scholarships and grants whenever possible. Our services uniquely showcase clients' athletic and academic accomplishments opening doors to Admission Offices across the nation. Prospective College Players are linked to College-Bound Athlete Scholarship Service's extensive network of College Coaches. Our 100% placement rate proves that there is a place for everyone to study and compete in his or her sport. I have traveled as far south as Clarkston, Georgia, north to Buffalo, and even to the former National Soccer Hall of Fame in Oneonta, New York to host workshops for college bound players. It all started in 1990 when John Morris, then the President of the Sound Beach Soccer Club, invited me to host my first workshop in 1990. Soon after, Albertson Academy asked me to do a workshop at the home of a parent who happened to have a full size gymnasium in his house! 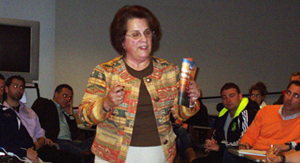 I’ve been a two-time guest at the Mad Dog Tournament in Saratoga, NY, and for many years led the Massapequa Invitational Tournament College Workshop. Last year, I even held a workshop out on a field at Peter C. Collins Soccer Park in Plainview for over 250 players and parents with the LIJSL Select PDP Program! Why do I tell you this? It’s to drive home the point that these workshops and forums come in all shapes, sizes, and venues. But what is most important is the information that you get there! The information gathering process is critical for any athlete who hopes to continue his or her career at the collegiate level. 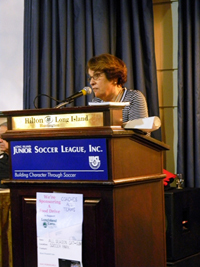 The largest groups I’ve hosted are always at the Long Island Junior Soccer League's annual convention, approximately 300 or more student-athletes and their parents. 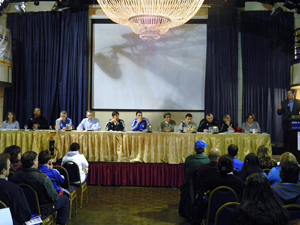 For the past three years we presented part of the program in Spanish due to the large Hispanic population of Soccer players in the New York region, just to make sure we could get the critical information to as many of our players as possible. While all of that information is certainly helpful, it has been my experience that student-athletes like to get personal accounts of the process from different perspectives. That is why I like to put together a panel of seven to eight presenters when I can. The group usually consists of College Coaches from Division I, Division II, Division III, NJCAA schools, junior college two-year programs, and community colleges, former players, a Club Coach, an educator/teacher and me. I'm the MC and represent the parents in the process. Having gone through it personally with my own children, I understand the worries, frustrations, and concerns of the parent. What is it like to play on a college team? What is a Coach looking for in a future player? Am I a Division I player? Which colleges and universities should I look at? A Question & Answer session normally follows, and within about 60 minutes, student-athletes have all the ammunition they need to go out and begin their search. The Long Island Junior Soccer League supports these workshops financially and offers their support to their 100 member clubs throughout Long Island and the New York City region. One of my future goals is to have an all Spanish-language College Bound Player Workshop, called "Operation Olé!" It’s been a challenge to get it organized, but with a little help from my friends in Soccer, we will get this up and running. In the past I have given two Hispanic workshops. One was at the LIJSL Convention, but attendance was down as we found that student-athletes and their parents sometimes had transportation challenges, so after that I traveled to them and did a workshop at a church in Southampton. Attendance instantly improved. 1. There is a college/university for everyone to play and study. 2. Better grades get more attention from College Coaches. 3. Select the schools that will provide the best academic opportunities. Workshops are a tremendous information-gathering opportunity for players, parents and Coaches, made available to you through the generosity and kindness of the Long Island Junior Soccer League. If you would like to set up a workshop with your club, please feel free to contact me at soccervol@aol.com. In January 2013 there were some recruiting rule modifications that I would like to share with student-athletes who are college bound. Unlimited recruiting materials can be sent to you in the mail and any time. Social Media is now allowed by College Coaches. You can receive texts, Facebook messages and also receive unlimited phone calls to eligible recruits. Coaches can begin contacting you after June 1st of your junior year. Unlimited numbers of the athletic staff an recruit prospects off campus. * A school that is affordable, as in a state school. If scholarship grants do not materialize you need to have an affordable school to fall back on. * An academic reach school. * A few schools in your academic comfort zone where you are likely to receive academic grant money, as well as athletic grants that will create a generous package. * Be sure your final choice offers your intended major. * Parents, make sure you know all about the academic support programs (tutoring) and percentage of those who graduate in four years. Truly, it’s all about the education and using your sport to get into the best academic situation you and your family can afford. Samantha B. was accepted early action by Tufts University. Samantha truly loves the school, but her parents don’t know yet what kind of package she will receive. Since Tufts is a Division III athletic school, they can hope for academic grants, perhaps an institutional scholarship, and maybe some outside money from places such as local community organizations. In this case, it would be wise to have a plan “B”; that is unless you are willing to pay the full tuition, room, board, and books, which can be extremely pricy. Recently, I worked with a Lacrosse Player who had narrowed down his choices to about 3 schools, I told him to send me the names of the schools and I would critique them, academically, athletically, financially and socially. Usually I look to see what the student-athlete's intended major may be and then I try to select the school that is the highest rank academically for that particular major. Last year, a well-known liberal arts college in the Boston area, heavily endowed by alumni, was able to match what it would cost Jimmy B. for a top state school. Jimmy decided to attend the private liberal arts college. Of course, Division I and Division II athletic institutions can offer athletic money, as well as academic or financial aid that can offer a more competitive financial package. With that being said, your best chance at being accepted to a good school and receiving any kind of financial award is by being the best student you can possibly be. This allows the coach who is recruiting you to be creative and obtain money from the school and not from his budget alone. When you do receive that first financial offer, don’t make a final decision without appealing for more money. Don’t ever take the first offer. Always be up front and honest with the coaches who are recruiting you, and make sure they understand your financial situation. Another thing to think about when deciding where you want to play your College Soccer is that players who receive an athletic grant/scholarship for their sport in D-I or D-II usually get playing time. Players who receive no athletic money usually sit on the sidelines for a while. That’s not a hard and fast rule, and it certainly isn’t written in stone, but more often than not, it tends to be the case. Be sure you are comfortable with the situation you are entering with your new team and coach. Before you sign that Letter of Intent or make that verbal commitment, be sure you ask all the right questions and see your package in writing on the letterhead of the university or college you will be attending. Don’t agree to anything until you are comfortable and completely clear on all the academic, athletic, and financial aspects of your acceptance. Questions, concerns, I’m just an e-mail away: soccervol@aol.com. It has been my experience that some athletes appear to be born with the gift of multiple talents, balance, speed, and size to name a few qualities. In the movie Chariots of Fire, the main character, a Sprinter, said "God made me fast." In addition, some sports require height and weight, which of course is genetic. For those not born with such attributes, they must develop by learning from others. What is the game plan for developing athletes? It’s simple; compete at the highest-level possible, be exposed to talented Coaches who have played at the collegiate or professional level and work very hard. I think it best to be trained and coached by many different people, so that you have a broad experience learning from lots of various sources. Summer camps are actually wonderful opportunities to grow and develop as an athlete. There have even been rumors of DNA testing in children to judge their athletic future, but this is inconclusive. Think about the Swimmer, yes he may have long arms which help and the slender physique but dedication counts tremendously, spending 6 hours a day in a pool. Waking up at 5:00 am for the first session, this is not inherited but acquired. Strength and conditioning programs are very important from ages 13-18 and help the athlete develop physically. I would say that born and made work together to produce outstanding athletes, there is no specific formula other than basic hard work. My client, Soccer Goalkeeper Dylan Crowe, from Mebane, NC has made a verbal commitment to play at the University of North Carolina Pembroke. You should start your search in 9th grade, position yourself to be in a competitive sports program at club level, try out for Varsity, train with professionals, work on fitness, and get your name out to College Coaches; request that they see you play and compete. Most importantly, play/compete at the highest level possible. You don't need to be the best player on your team but be among the best players! You might also want to attend a camp in the summer, or perhaps a camp offered at a college campus run by the Head Coach of the sport where you intend to compete in college. Video is always a good idea, and of course networking with the College Coaches. A video will pique their interest and hopefully get them to come and see you compete. I would also recommend that whenever you get post season, states, regional, finals, as well as college showcases and combines, be in touch with the College Coaches. When emailing, include your video link on YouTube, and attach your updated athletic-academic profile. College Coaches are looking to identify "talented sophomores" and will keep you on their radar. If you are a Golfer, run Track, Cross Country, play Tennis, or are a Wrestler, you will want to keep the College Coach apprised of your personal best. If you play a spring sport like Baseball, Lacrosse, Softball, etc. starting early is essential. You may also want to visit the college or university, and you can do this as a freshman, sophomore or junior, but you must initiate the visit. College Coaches cannot actively recruit you until the end of junior year. As a 9th grader, take challenging courses and get good grades; better grades get more attention and more money from College Coaches. Always choose the college/university that has your major, the right demographics, such as location, size and environment, as well as the best academic opportunity.